The Fellowship was fortunate enough to obtain a copy of HIT: 1957 #1 from BOOM! Studios. Bryce Carlson writes, Vanesa R. Del Rey draws and Niko Guardia colors. Bonnie has a great life, but it might be just a little too good to last. Slater is an L.A. cop who needs to solve a big case to keep his superiors from questioning his methods. He’ll get his case, along with all of the baggage that comes with it (and his partner’s). And Bonnie’s past life is catching up with her, disturbing her peace and putting her in a bad situation. The HIT team is back for another round of the dark, brooding underbelly of 1950s society. This issue is packed with raw emotion and brutal violence, and has the beginning of a story that will show us what both Bonnie and Slater are made of. And the art is just perfect for the noir style; it grasps the style of the time period and uses darkness to stunning effect. This team really knows how to handle noir, both in the amazing visuals and in the characters and relationships. This book is a great example of how powerful the genre can be. 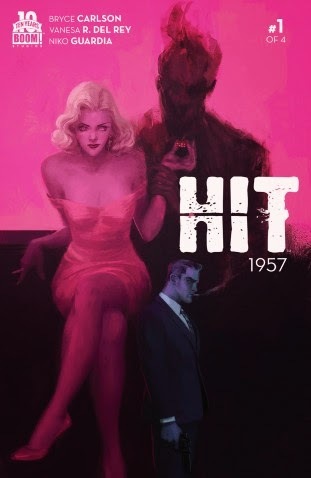 HIT: 1957 #1 is available now at your FLCS or at boom-studios.com.